The Safety and Health on the Job (Spanish) is a job safety law poster by the Kentucky Labor Cabinet. This is a mandatory posting for all employers in Kentucky, and businesses who fail to comply may be subject to fines or sanctions. This poster must be posted in a conspicuous place where all Spanish language employees will see it. This poster describes the responsibilities of employers to keep up with any occupational safety and health regulations and that employees have the right to file a complaint should employers fail to keep up with regulations. Employers may face penalties for serious violations of safety and health regulations. It appears you don't have a PDF plugin for this browser. Please see the link below to download kentucky-ky-osh-poster-spanish.pdf. Los estatutos revisados de Kentucky (KRS), en su Capítulo 338, establecen en el ámbito del Gabinete de Trabajo (Labor Cabinet) un programa de salud y seguridad ocupacional. estar claramente visible en el lugar de trabajo. Capítulo 338 que aplican a sus acciones y conductas laborales. sea necesario. Todas las reuniones están abiertas al público. empleados que presenten la queja no serán revelados cuando así se solicite. corregirse con la finalidad de informar a todos los empleados. El empleador debe exhibir dicha citación durante 3 días o hasta que la violación haya sido corregida. con $70,000 por cada violación, pero no menos de $5,000 por cada violación tipificada como intencional. Mantenimiento de Registros: Los empleadores tienen la obligación de mantener registros de muertes ocupacionales, accidentes, y enfermedades que sobrevengan a sus empleados. Industrial del Sistema de Norte América están exentos del requerimiento de mantener dichos registros. reportar una lesión o enfermedad relacionada con el trabajo sin ser objeto de represalias. de trabajo, cursos de adiestramiento y una variedad de información y publicaciones técnicas de autoayuda. programa ni podrá ser víctima de discriminación alguna. 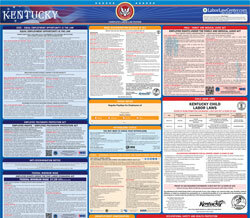 There are an additional twelve optional and mandatory Kentucky labor law posters that may be relevant to your business. Be sure to also print all relevant state labor law posters, as well as all mandatory federal labor law posters. While we do our best to keep our list of Kentucky labor law posters up to date and complete, we cannot be held liable for errors or omissions. Is the poster on this page out-of-date or not working? Please let us know and we will fix it ASAP. LaborPosters.org will email you a printable PDF of this Kentucky labor law poster, 100% FREE. You'll also get notified when new posters are available. Your Kentucky poster has been downloaded and emailed! This poster download is provided as-is, with no warranty or guarantees. Please verify with Federal and Kentucky authorities to confirm that you are posting all of the correct (and updated) posters required for your type of business. Instead of printing out pages of mandatory Kentucky and Federal labor law posters, you can purchase a professional, laminated all-in-one labor poster.